Ahhh, do you smell that? It’s the smell of pumpkin spice everything which can only mean one thing: Fall is here! While this season is the perfect time to enjoy hayrides, apple cider, and pumpkin patches, it’s also a great time to get a jump start on preparing your house for the cold weather of the upcoming winter months. 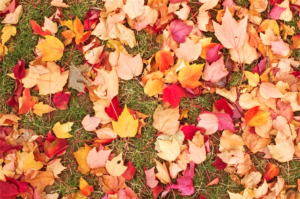 Clean Gutters and Roof– Falling leaves mean a messy roof and gutters! Prevent clogged downspouts by regularly clearing the leaves and debris from your roof and gutters. While you’re up there, check for low hanging or dead branches that should be trimmed to prevent an even bigger issue if things get icy this winter. Clean Chimney– Have your chimney ready to go for that first cozy fire of the season. You’ll want to be sure that there isn’t any build-up in your chimney (fire hazard!) and that the flue is in good working order. Repair/Replace Caulk and Weather Stripping– Do a quick inspection around all windows and doors to prevent drafts and increase your energy efficiency. This simple task could go a long way to combat those high heating bills of the winter! Winterize Outdoor Faucets– Be sure to insulate your outdoor spigots and faucets. A frozen pipe can lead to major issues during the first big freeze. While you’re at it, go ahead and put away hoses and other outdoor tools. You won’t need them during the winter months anyway! Seed Your Lawn– Did you know that this is the best time of year to aerate, fertilize, and re-seed your lawn? Take care of this now for beautiful, lush grass in the spring! Just one Fall weekend of work could get your home ready for the entire winter. Don’t have time during the big game to take care of your honey-do list? That’s ok! The Peters Company has an extensive list of vendors who can cover these items for you. Just let us know!